For more information see https://www.ncdc.noaa.gov/oa/climate/research/sst/ersstv3.php. PSD standard NetCDF ~60 Mbyte file for each monthly file. PSD standard NetCDF 388 Kbyte file for each long term mean file..
Data have been interpolated in time and space by the providers. Land points are flagged with a value of -9.96921e+36. Please note: If you acquire NOAA_ERSST_V4 data products from PSD, we ask that you acknowledge us in your use of the data. 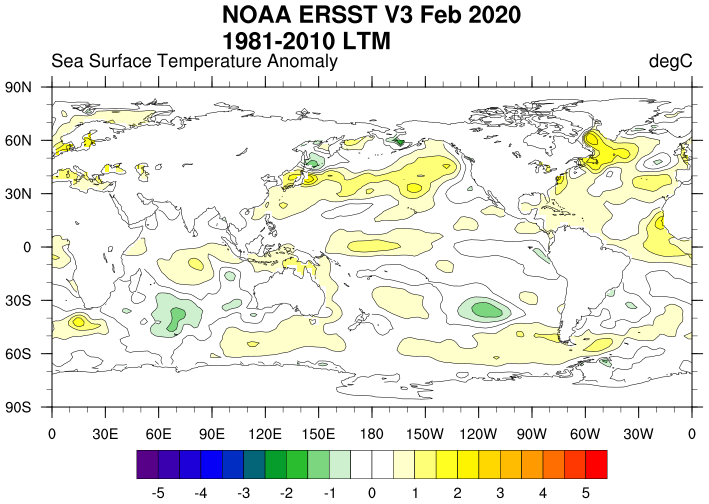 This may be done by including text such as NOAA_ERSST_V4 data provided by the NOAA/OAR/ESRL PSD, Boulder, Colorado, USA, from their Web site at https://www.esrl.noaa.gov/psd/ in any documents or publications using these data. We would also appreciate receiving a copy of the relevant publications. This will help PSD to justify keeping the NOAA_ERSST_V4 data set freely available online in the future. Thank you!